It's the middle of summer, so you deserve something cool at the end of the day. We've got just the treat for you. It's simple to make and you can easily get creative with the recipe and change up the toppings. So, kick back and enjoy. 1. 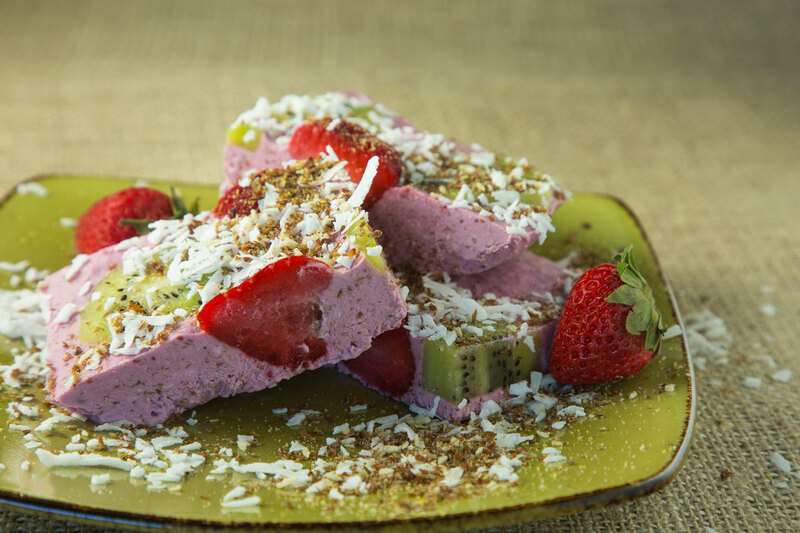 Place Greek yogurt, Strawberry Kiwi Greens and coconut cream in a blender and mix until thick and creamy. Pour into a bowl. 2. In another bowl, add the walnuts, kiwi, Antioxidant Blend, strawberries and coconut shreds. Stir and pour into yogurt mix. 3. Line an 8x8 pan (or something similar, i.e., brownie pan) with parchment paper. Pour in the mixture. Sprinkle with extra walnuts, chocolate chips, Antioxidant Blend, raspberries and coconut shreds on top. 4. Cover and freeze for at least 12 hours. 5. Remove from the freezer. After about 15 minutes you can remove the whole bar from the pan (you will cut after removing). The parchment paper helps the bars come out easily. 6. Remove parchment paper and cut bars into a size that suits you. Option to sprinkle extra walnuts, chocolate chips, Antioxidant Blend, raspberries and coconut shreds on bars and serve immediately. 7. If you have any leftovers, you can store in the freezer in an airtight container.